Pavel joined the company in 2014 and has since had duties which involve advising clients on a wide range of patent-related issues, preparing hundreds of inventions, utility models and design applications, handled ownership changes with regards to patents, as well as advising on patent infringement matters. He also prepares and drafts assignment recordals and licensing agreements. Pavel’s tertiary education began at the Taras Shevchenko National University where he earned a Bachelor’s Degree in Molecular Biology in 2005 from the Department of biochemistry. Alongside, he had additional education on the military faculty of the same institution as a Lieutenant in the department of Radiology, Chemical and Biological Protection. From 2005 to 2007, Pavel studied for and received a Master’s degree also in Molecular Biology from the very same Tarasa Shevchenko National University. He went on to receive a PhD in Molecular Biology from the same school. As a PhD student he worked in the Department of Human Genomics for the Institute of Molecular Biology and Genetics of the National Academy of Sciences of Ukraine under supervision of full professor Lyudmila A. Livshits. His thesis covered the topic on “Gene polymorphisms of detoxcation system enzymes and phrothrombotic factors”. His Postdoc from 2013 to 2014 was spent in the lab of Professor Doron Lancet, Department of Molecular Genetics, Weizmann Institute of Science, as a laboratory manager, studying the genetic basis of IDIS, CGA and CLS, Rehovot, Israel. In 2015 he continued his PostDoc at the lab of Professor BeniLerer, Department of Biological Psychiatry, Hadassah – Hebrew University, in the Faculty of Medicine in Jerusalem, Israel. Pavel started work in 2002 & 2003 with student practice and research, studying Scientific Activity at the Institute of Molecular Biology and Genetics of National Academy of Sciences of Ukraine, T-System for identification of SARS. His practice continued through 2003 to 2005 at the Scientific and Technical Center of Immunobiotechnology “DiaProfMed” at the Department of Biotechnology of the National Academy of Science of Ukraine where he worked on the Syntez of recombinant protein A S. Aureus and “Syntez” of the Recombinant Protein gp 51 analogue of glycoprotein of membrane of bavenleukemia. He became a Teacher of Biology at the Kyiv Jewish Gymnasium #299 from 2004 to 2005, a part time job he took during his study at the university. 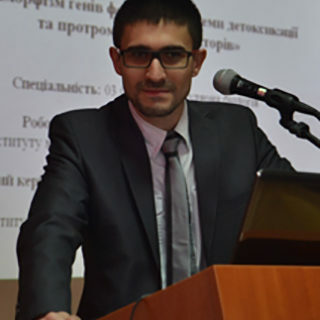 Pavel also worked as a junior scientist from 2005 to 2013 on the CHERISH Project on Scientific Activity in Molecular Biology at the R&D Institute of Molecular Biology and Genetics of National Academy of Science of Ukraine in the department of Human Genetics where he was also the project manager (this was during his PhD). His work included grant agreements, preparation of forms, scientific and financial reports, equipment and reagent marketing search, purchases and work with the customs service. He also served as conference organizing committee team member within the scientific aspects. In 2014 he became a young scientific researcher at the Educational and Scientific Centre “Institute of Biology”, Kyiv Ukraine. His Research techniques and collaboration experience cover: General gene engineering techniques such as DNA purification, PCR (Real-time), RFLP, CGH-array, 4С, primers design, bioinformatics, agarose gel electrophoresis, SDS-PAGE, molecular cloning and sequencing of DNA, working according to protocols (SOP); European Commission – Seventh Framework Programme (FP7) CHERISH project (grant agreement # 223692). Grant with Russian Federation – search for new genetic markers for stroke in Ukrainian and Russian populations. Grant with Russian Federation – Genetic predisposition for gestosis and preeclampsia in women from Ukraine and Russia. 4. 6th ISABS Conference on human genome project based applications in forensic science, anthropology and individualized medicine, Split, Croatia (2009). As Patent Administrator with the IPR Group, Pavel’s work is focused on all aspects of patent applications prosecution, also on national entries of PCT applications to Russia, Ukraine, Kazakhstan, Uzbekistan and other CIS countries and regional entries of PCT applications to EAPO. His expertise includes drafting responses on the requests of substantive examination of Patent Offices. And thanks to his extensive education, presently he provides quality services for the protection of intellectual property rights in the field of Molecular Biology. 2. Young Investigator Award – 6th ISABS Conference on human genome project based applications in forensic science, anthropology and individualized medicine, Split, Croatia 2009. 5. Intellectual potential of young scientists – to the city of Kyiv, Kyiv, Ukraine 2006. With a willingness to learn even more and skills in research dissertation, communication, problem solving, team work as well as computer based skills, Pavel has had a worthwhile career and spends his free time on his mountain bike, reading, camping and rafting.